This is the first in a series of articles about the New York Central Railroad’s Putnam Division, commonly known as the ‘Old Putnam Line’, and it’s various routes through Pocantico Hills, NY. Originally planned as the New York and Boston Railroad in 1869, and after a series of bankruptcies and mergers, the line was opened as the ‘New York City and Northern Railroad’ in 1880 and passed through the village of Pocantico Hills on its way from NYC to Brewster, in Putnam County NY. 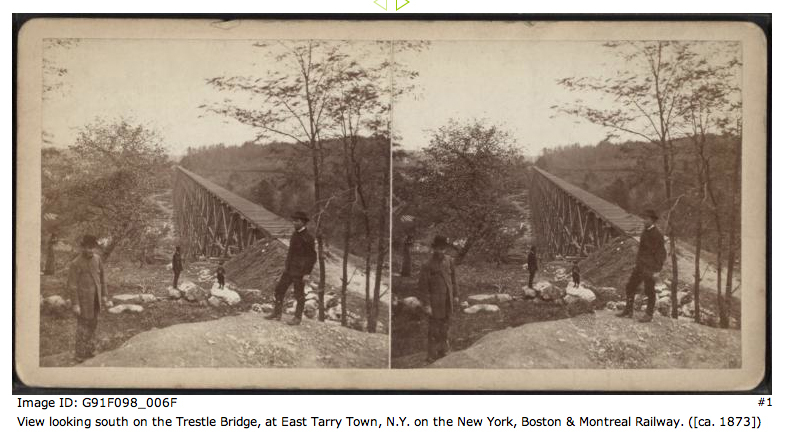 The initial route of the Old Putnam Line through Pocantico Hills was in use for only 1 year (from 1880-1881) and was notable for the large wooden Eastview Trestle, which crossed the valley in what is now the Tarrytown Reservoir, but was then only a low-lying marshy area. Because the weight & speed of trains was limited by the trestle, the line was quickly re-routed in 1882 along a sweeping curve westward to Tarrytown Heights, before climbing back north-eastward to Pocantico Hills. 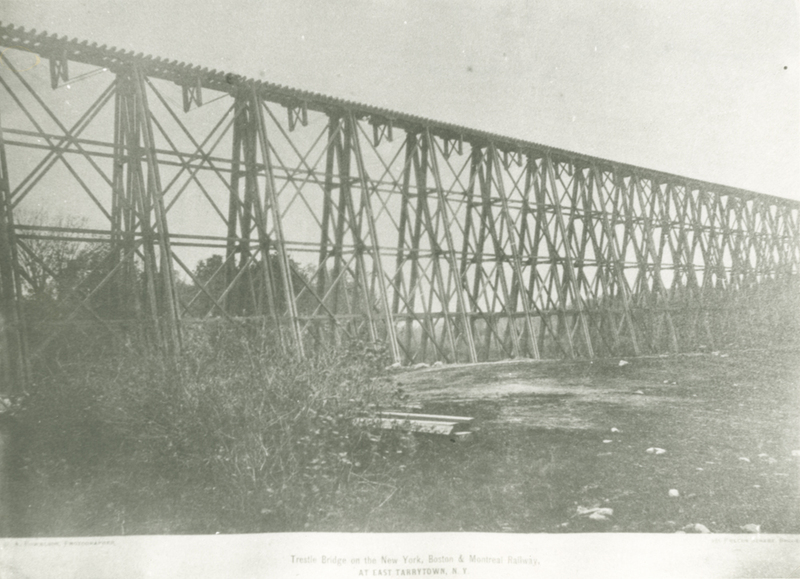 The trestle was then torn down in early 1883. The first two routes of the Old Putnam Line are visible in this map (the 1880-1881 route in orange, and the 1882-1930 route in red). The Eastview Trestle was located where the orange line crosses the reservoir on the map above. 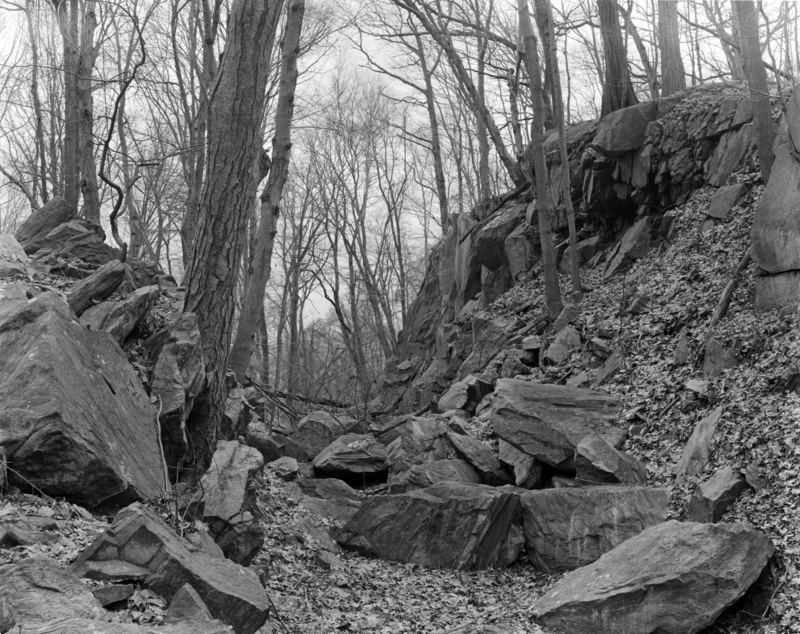 Fallen rocks from the cliff on the right now cover the former track-bed. A train hasn’t passed through this rock-cut in 130 years. 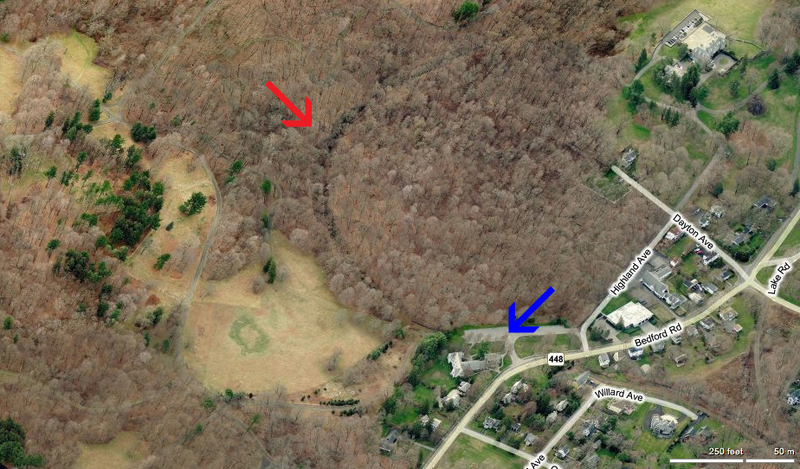 The railroad line then leaves the rock-cut (red) behind the present site of the Union Church of Pocantico Hills (blue), and passes along what is now Willard Road. 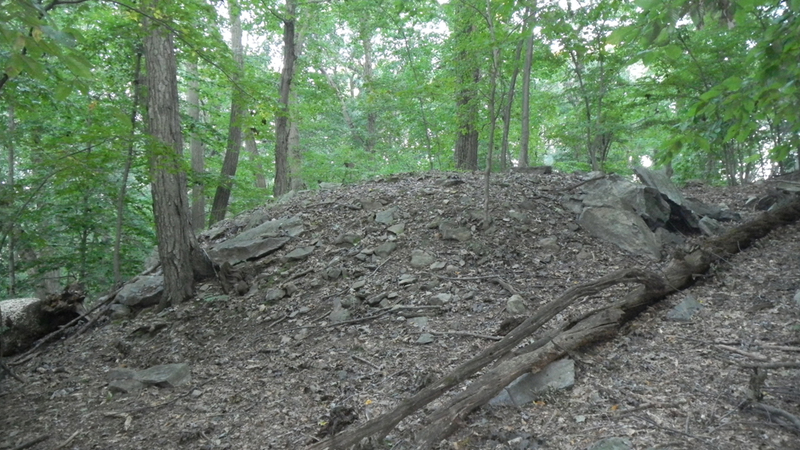 Other interesting sites along the Old Putnam Line through Pocantico Hills will be explored in future posts. So stay tuned. Well Done………Are these trails / tracks, Hikeable? Perhaps one I’ll get to the area and take a look……..
Yeah, a portion of the old RR bed is now a bicycle trail paved in asphalt. But the initial route, which used the trestle, was abandoned long ago, and is now overgrown. The trestle makes me think of Stand by Me,remember when they have to cross the one in the movie to go see the dead body. It certainly does not look sturdy enough to hold a train. moving at speed.. Your stories always strike a cord in me of time passing and the works we do just fade away so easily. Nature rules! Thanks for sharing the great video Scott. Very interesting. 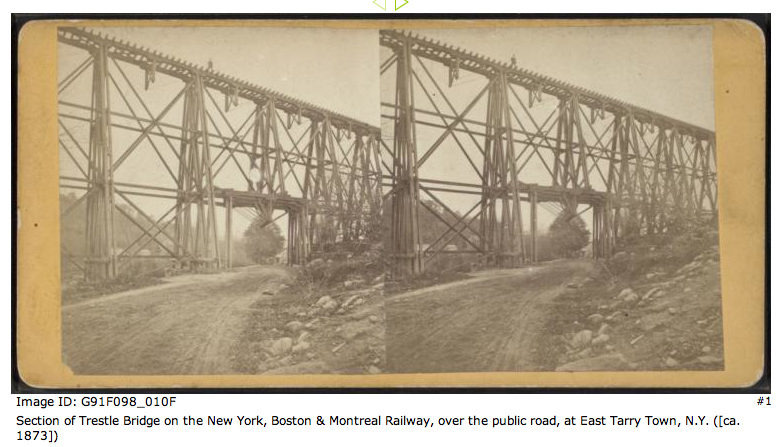 I’d never seen pictures of the trestle. There is another “story” about the original route across the reservoir. Somewhat West of your orange line and crossing the reservoir S-N and closer to perpendicular there is a causeway with a break for the water to flow through and presumably once bridged. I saw it in the prolonged droughts of the early 1960s. It is visible as a submereged shadow in Bing Maps (oblique Pictometery) imagery. So it’s not a story, it’s there. This is East of the current roadway causeway between the two lakes. When the causeway became disused the height of the dam impounding the lakes was raised which is why it is now submerged. I think I saw this documented at the Historical Society of Tarrytown and Sleepy Hollow. My father lived in Pocantico from around 1920 to 1932 so he knew the 2nd, Tower Hill, route and the 3rd, Eastview, route. He told me the causeway had been the first route, but that is inconsistent with your photographs. It appears possible that the dam could have been raised after the third route was completed and the water level would not have interfered with the 2nd, Tower Hill loop. But it leaves the question of what the causeway was for. Hi Scott, This is Mitch Dakelman of Highland Park, NJ — remember me, you used some of my slides for a program. I’d like to chat with you about a film you have on You Tube — THE VANISHING EL, the color version. Lucas, it was a pleasure bumping into you and Mark yesterday on the “Old Put” (1880-1930 alignment). Here’s the map from the 1929-1931 Westchester County Atlas which shows that a “stub” of the 1870s railroad property still existed (just south of Eastview), so the approximate junction point of the pre-and-post-1881 tracks is visible. 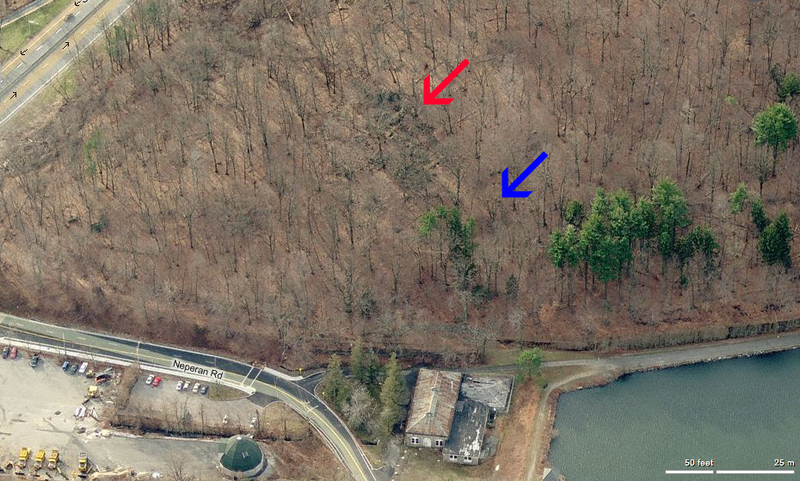 Also notice the Saw Mill River Parkway property which had just been purchased (the former owner’s name is still on the map), on the slopes of Beaver Hill. One more thing…perhaps you noticed that, on this map from the 1881 Westchester County Atlas, the then-brand-new alignment is shown (around the Storm Creek valley and beyond), BUT there is a faint trace of the trestle-bridge alignment visible as well! As you sleuthed out three years ago, the bridge was still in place at that point, but scheduled to be dismantled. Either the tracing on this map is an incomplete erasure of the alignment drawn on the map but removed before printing, or it’s someone’s pencil line, drawn in after printing for whatever reason. Any thoughts? Note that the alignment isn’t entirely accurate, especially where it fades out around the south-abutment rock cut you discovered several winters ago. Hi John, It was a pleasure meeting you too. And thanks for the links. Yes, I’m familiar with these maps; and you’re right the ‘stub’ shown on the 1929-1930 Atlas is a remnant of the initial 1880 right-of-way. As for the 1881 map, I hadn’t noticed the faint outline of the 1880 trestle-bridge alignment. It looks like a pencil marking to me. Yeah, the trestle would have been still standing in 1881 when that atlas was published, but pencil line of the old trestle alignment might have been drawn in much later; possibly by someone trying to retrace the original railroad route. 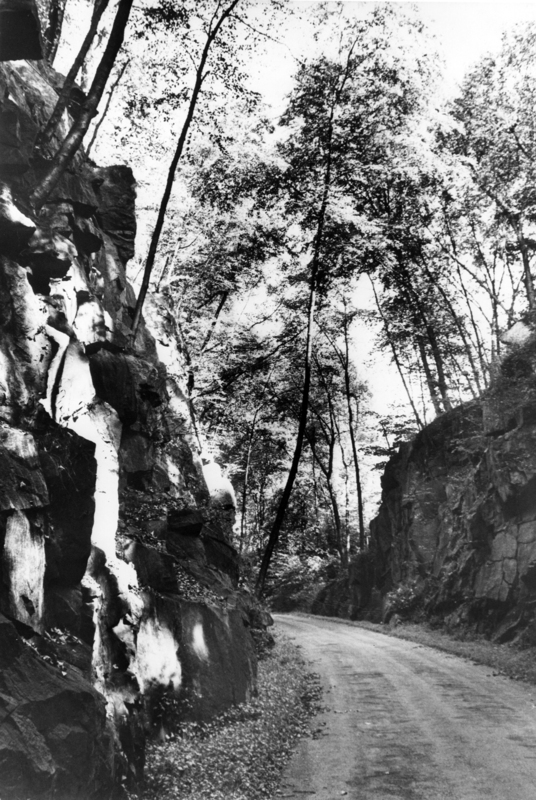 I think that one of the interesting things about the deep rock cut before the trestle bridge on the Rockefeller property, once owned by Lewis Roberts, my g g granddad is that, according to Gallo, the cut was made the hard way, by hand, instead of by dynamite. In the side of the wall is a sculpture of what looks like an English Setter and a little place for water. I have no idea why that was sculptured, maybe someone’s dog. Arthur, that’s fantastic! I remember the dog-sculpture water pool well, from my 1970s childhood walks, back when the Rockefellers were kind enough to let neighbors unobtrusively enjoy that section of the grounds. I’d be amazed if dynamite wasn’t used — some of that cut is really deep — but if that’s what you were told, I guess I’ll have to believe it. God knows what was really used to make the rock cut. I’m going by what Jerry Flanagan, the Chief of Security, told me around 30 years ago. Jerry was very interested in the history of the place. He went way out of his way to help us find relevant information. Besides taking us on a tour in a security car, he took us into some small building where he had drawers full of old property maps, as well as to his friend at Sleepy Hollow Cemetery. I took photos of everything that was relevant, including where various people lived on that big property. He couldn’t have been more helpful. Yes, I agree with your noting about how kind they were. I should also adds that they were hospitable and very tolerant, considering that there were Rockefellers on the property at the time. I wonder how many people know of the initials of residents of Pocantico Hills that are chisled in the face of a rock near that stone water pool. I walked the rock cut in the 1950’s but best of all heard my echo when I yelled. We all had the freedom then to walk and climb. In 2016 I was refused permission to walk the cut. How times have changed. There is a story about the first trip over the Eastview Trestle Bridge in “The Putnam Division: New York Central’s Bygone Route Through Westchester County” Jan 1, 1989 by Gallo, Daniel R., And Frederick A. Kramer [amazon.com]. My g,g,grandfather, Lewis Roberts, who was in charge of the RR construction, told the Engine driver (engineer) to take the engine across the bridge without him. I wonder how the engineer felt about that. Apparently, either the cut or the bridge was a record for its height at the time. Did they let it go because they knew that the Croton Dam was going to be constructed? Do you know when the first Tarrytown Reservoir Dam was built? 1897. That’s about fifteen years after the RR was re routed (and the trestle dismantled). I don’t think the creation of the reservoir affected the RR route at all, because it was well above the water level along its entire length. The closest they came to each other, elevation-wise, was where the RR passed near the south end of the dam. 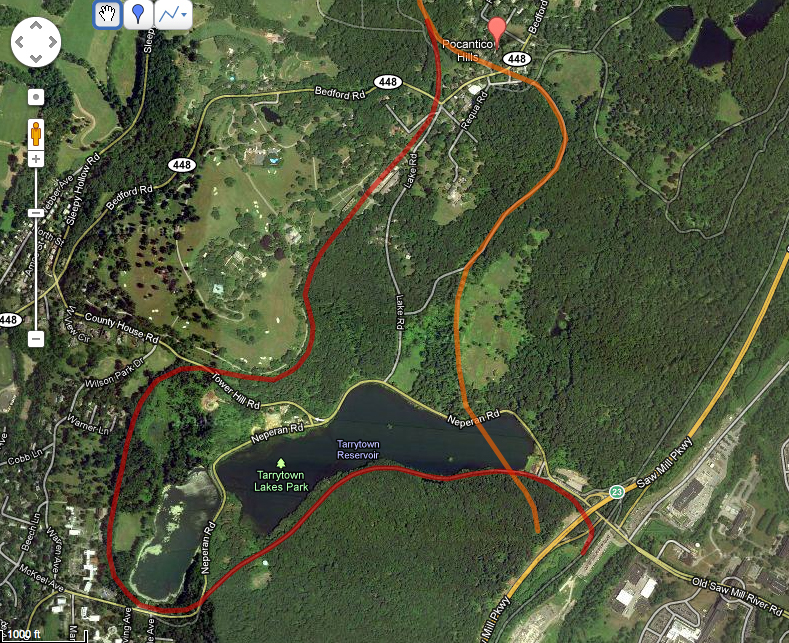 I am very confused: what was the route of the putnam line after it left pocantico hills? Did it continue along Bedford Avenue toward Briarcliff? or did it go down a Rockefeller Trail? Drawing this on a map would be really helpful! 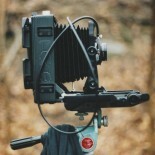 This entry was posted on September 21, 2011 by Lucas Buresch in Historic sites, Pocantico Hills, Railraods.